The Planax Copy Binder Thermal Binding Machine is the fast and ideal solution to finish your printed projects into professional-looking, high quality documents. With the press of a button your document will have a clean, compact bind. 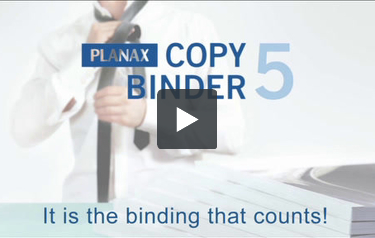 The Copy Binder is perfect for binding jobs of 5 to 330 sheets (excluding covers). With its outstanding processing capabilities, simple operation, and economically priced consumables, the COPY Binder is the perfect solution for offices, copy shops, tax consultants, auditors and much more! Very exact spine binding for a very professional look. Fast, precise, and clean finished projects. Finished projects are able to lay flat for optimal readability and comfort. High security of investment and economically priced consumables.